Elliott Wave Theory interprets market actions in terms of recurrent price structures. 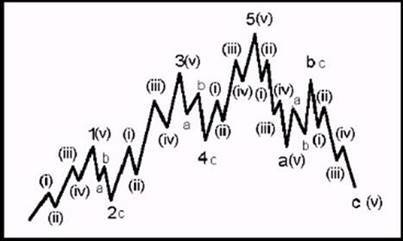 Basically, Market cycles are composed of two major types of Wave : Impulse Wave and Corrective Wave. For every impulse wave, it can be sub-divided into 5 - wave structure (1-2-3-4-5), while for corrective wave, it can be sub-divided into 3 - wave structures (a-b-c). 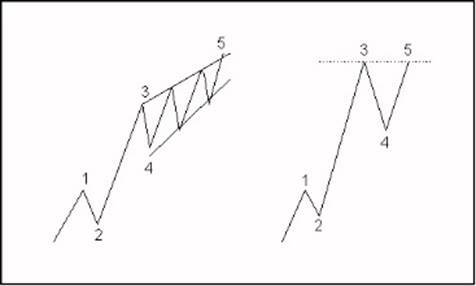 An important feature of Elliott Wave is that they are fractal in nature. 'Fractal' means market structure are built from similar patterns on a larger or smaller scales. Therefore, we can count the wave on a long-term yearly market chart as well as short-term hourly market chart. 3. Wave 4 should not overlap with Wave 1, except for wave 1, 5, a or c of a higher degree. 4. 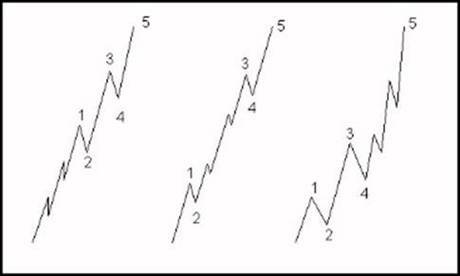 Rule of Alternation: Wave 2 and 4 should unfold in two different wave forms. Among Wave 1, 3 and 5, only one should unfolded into extended wave. 'Extension' means the wave is elongated in nature and sub-waves are conspicuous in relation to waves of higher degree. Sometimes, the momentum at Wave 5 is so weak that the 2nd and 4th sub-waves overlap with each other and evolved into diagonal triangle. In some other circumstances, the Wave 5 is so weak than it even cannot surpass the top of the wave 3, causing a double top at the end of the trend. 1. 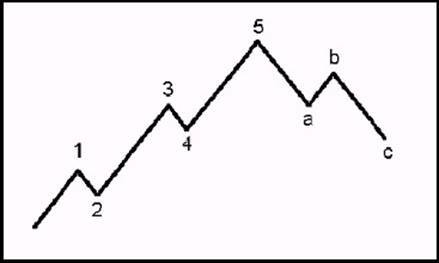 Zig-Zag : abc pattern composed of 5-3-5 sub-wave structure. 2. Flat : abc pattern composed of 3-3-5 sub-wave structure, with b equals a. 3. Irregular : abc pattern composed of 3-3-5 sub-wave structure, with b longer than a. 4. Horizontal Triangle : 5-wave triangular pattern composed of 3-3-3-3-3 sub-wave structure. 5. Double Three : abcxabc pattern composed of any two from above, linked by x wave. 6. Triple Three : abcxabcxabc pattern composed of any three from above, linked by two x waves. 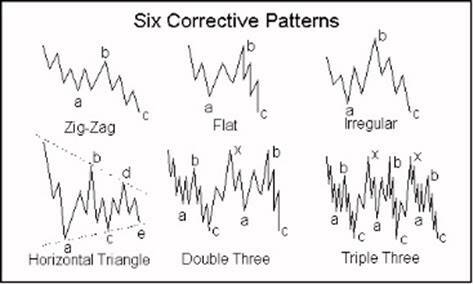 The attractiveness of Elliott Wave Analysis is : Three impulse wave forms and six corrective wave forms are conclusive. All we have to do is to identify which wave form is going to unfold in order to predict future market actions. This is a bold statement, needless to say, knowledge of market historical wave patterns and experiences in wave count are of paramount importance.